SELLER WILL CONTRIBUTE $1,000 TOWARDS CLOSING COSTS! Affordable housing in the Cambridge school district. 3 bedrooms, 2 full baths, large pantry, country kitchen, lots of original detail, new rugs & fresh coat of paint. Even a space for a small home business with private entrance. 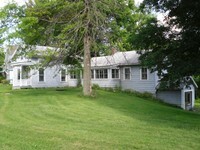 1.53 acres & small barn complete the package.